Lying between Leo and Gemini, Cancer is a constellation easy to pass over. Nearly passed over by my camera, too, the stars not being bright enough to be seen in the viewfinder. Cancer is actually at the bottom on the image, on its side with M44 clearly visible but Beta Cancri has just escaped. 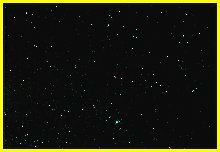 The stars at the bottom left belong to Hyda, top right is Lynx and Leo Minor, while the rest belong to Leo, with the 'head' stars top centre and Regulus top left.